While there have been many exhibitions devoted to great fashion designers, only a few have focused on individual women of style. Yet certain singular women play a crucial role in fashion. Known as fashion or style icons, they are a special type of fashion insider, one who not only inspires designers and brings their clothes to life, but actually creates a look that affects the way other people dress and/or think about dressing. 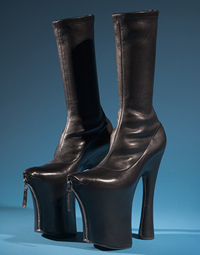 Boots by Alexander McQueen. From the collection of Daphne Guinness. Although Guinness has inspired some of the world’s greatest couturiers – from Karl Lagerfeld to Valentino – she says that she is “not a muse,” but more like “a bee” flitting from one designer to another. This is proven by the array of designers whose work will be on display. A close friend of the late Alexander McQueen, the exhibition will include more than two dozen McQueen garments which have never been displayed. Also featured will be extraordinary haute couture from Chanel, Dior, Givenchy, Lacroix, and Valentino, as well as demi-couture by Azzedine Alaia, Tom Ford, Dolce & Gabbana, and Rick Owens, and futuristic styles by young designers such as Gareth Pugh. Clothes that Guinness has designed herself will show her love of uniforms. Dress by Chanel. From the collection of Daphne Guinness. Another exhibition highlight will be a wide range of extraordinary accessories, many of which were created in collaboration with Guinness. These include Philip Treacy’s hats and Shaun Leane’s “armor” jewelry, not to mention towering platform shoes made especially for her by Christian Louboutin and Noritaka Tatehana. Several of Guinness’s films will be shown, including The Phenomenology of the Body (which explores the politics of clothing), Mnemosyne (which was inspired by her perfume), and Tribute to Alexander McQueen, as well as numerous images and videos. Daphne Guinness will be co-curated by Daphne Guinness and Valerie Steele, director and chief curator. of The Museum at FIT, with the assistance of Fred Dennis, senior curator of Costume. The exhibition’s design, by Ken Nintzel, will be inspired by Guinness’s New York apartment. The exhibition will be accompanied by a book, also titled Daphne Guinness, written by Valerie Steele and Daphne Guinness, and published by Yale University Press. All royalties from sales of the book will benefit the Fashion Institute of Technology. 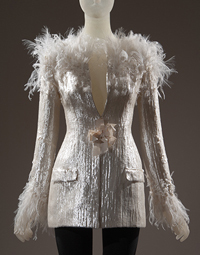 This entry was posted in Exhibition and tagged Daphne Guinness, MFIT. Bookmark the permalink. Hopefully, for our sake which hay day cheats will get by. a year ahead of the vegetable growing season.